I fell in love with Mexico City when I was fifteen. It was a high school Spanish class trip. Till this day I still can’t believe my parents allowed me to go. I didn’t know any Spanish. It wasn’t even my high school. Someone dropped out last minute and somehow, since I had a friend that was going, they made arrangements for me to go too. We scrambled to get my birth certificate, since, at that time, passports weren’t required. I’d never been out of the country and had only flown once. To say my mom was worried about me going was an understatement. But I went. As a girl raised in the South in the seventies I’d venture to say I’d never seen a Mexican. Let alone millions. Houses stacked up like Jenga blocks on mountains in an altitude higher than I’d ever been. Mexico City is notorious for smog but there must not have been much the day we flew in because I’ll never forget how far the city stretched. It was as far as you could see and made quite an impression. I also remember the people without homes. This was probably my first real encounter with homelessness. Seeing people living on the streets, women and even children, begging for help made a lasting impression on my 15 yr old heart. I wasn’t from a rich family but we were comfortable and I had never lacked for anything. After this trip, I had a newfound gratefulness for the privileges I had. And not just for things but also for my family. That trip was also the reason I decided to learn Spanish. All it took was getting separated from half the class and the teachers, that spoke Spanish, on the city’s Metro train. Notorious for it’s fast closing doors and crowds, I’ll never forget the look on the teacher’s faces, as the six of us that got on, pulled away from the station. How we made it back to where we needed to be, I’ll never know. Other things I remember about that trip were all the fresh flowers in the markets. Eating nopales for the first time. Seeing a folkloric ballet at the Palacio de Bellas Artes. There was nothing like it. Needless to say I was smitten with Mexico. Mexico City, or “el DF”, to this day, is one of the most exciting, complex, and somewhat overwhelming cities I’ve ever been to. A lot has changed. There are even more people. There are more cars. There are new modern and hipper neighborhoods with museums, coffee shops and trendy eateries everyone wants to go to. But for as much as it’s changed, a lot has stayed the same. That old world charm is still there and the people are just as friendly. I’ve been back several times since that first trip. Recently, I had the chance to go solo. 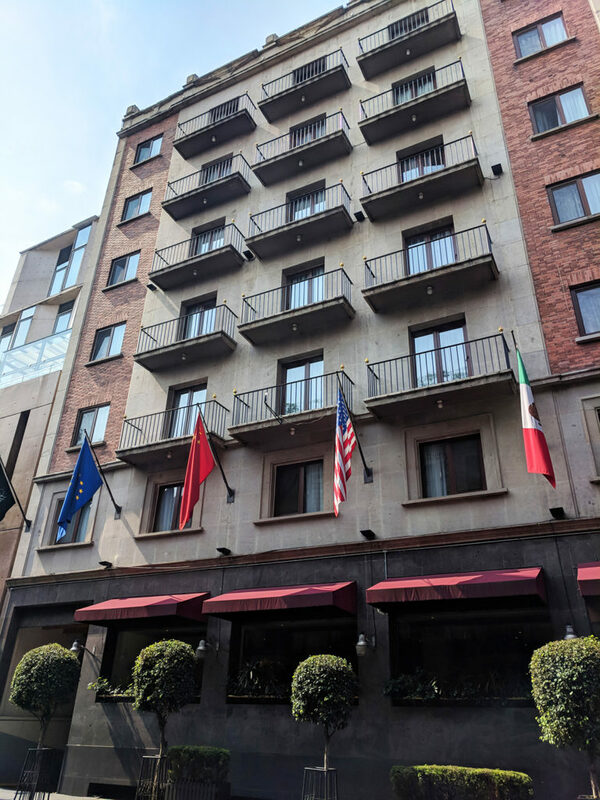 I decided to revisit the older, more historical Mexico City again, and try to rediscover the wonder I had experienced at fifteen. Throw in a couple of new experiences and it was the perfect nostalgic weekend. I still don’t know if I left my mark on Mexico City but it definitely left it’s mark on me. Mexico City is a non stop flight on most carriers from larger US cities and some European cities. Travel requires a passport but United States citizens do not need a visa. Mexico uses an online system which allows citizens of eligible countries traveling by air to obtain electronic authorization to travel to Mexico for tourism or business purposes without a visa. Travel within the country is super efficient as well. Aeromexico, Interjet, Viva and Volaris all offer frequent flights within Mexico, to Mexico City from most other cities. Once you are in Mexico City, getting around is also very easy. Depending on your budget you could drive, ride a train, bus, taxi or Uber. The Historic Center is about thirty minutes from the airport. If you’ve read any of my posts, you know I’m a huge fan of Uber in Mexico. Uber is so popular there is an Instagram page that features things that have been said or that have happened on an Uber ride. The service is excellent and the cars are new. Many cities feature Uber Pool which allows you to share a ride to budget your money. Unlike in some smaller cities, Uber is available at the Mexico City airport too. Some hotels do offer shuttle service but it’s usually an additional fee and the fee is more than an Uber ride. Once you are in the Historic Zone, it’s easier to walk than ride. Walking is very safe and you will see a lot of police presence to keep it that way. I walked late at night but was careful to stay on main streets with others. Unfortunately, I still have not conquered my fear of the Metro. After the getting separated incident, I have not ridden it again. It is super efficient and fast, with convenient stations located all over the city. I’ll have to save info about it for another trip and another post. I’m determined to ride it again. There is no shortage of great places to eat and drink in the city. Here are a few of my favorites in the historic district. The Opera Bar is a great place to take a break after walking around in “el Centro Historico”. 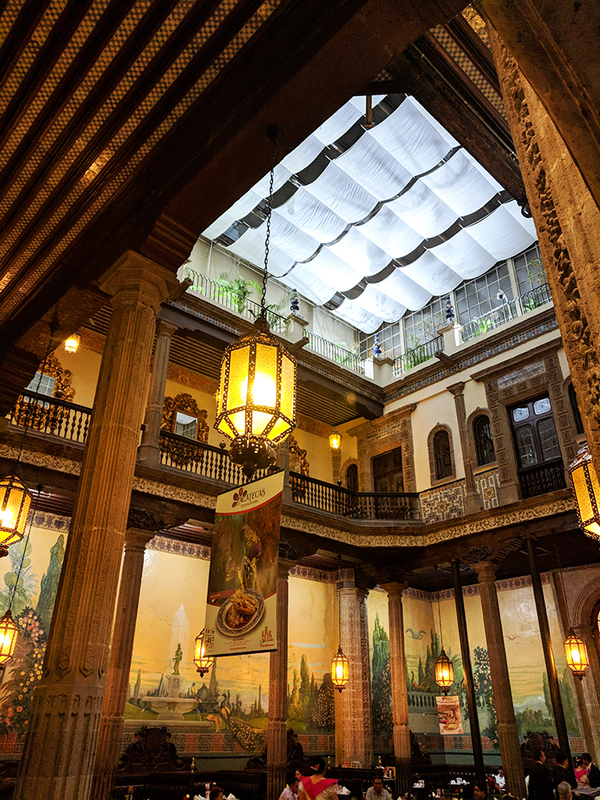 Opened by two French brothers in 1876, it’s one of Mexico City’s oldest bars. It’s pretty ornate for a cantina but you can definitely see the French influence. 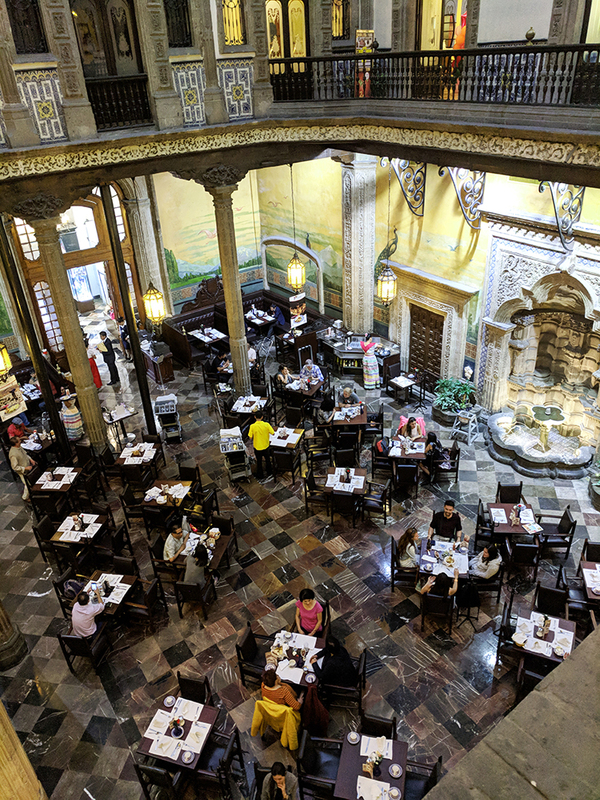 The who’s who’s of Mexico City have been dining there for years. Even Pacho Villa visited and there’s a bullet hole to prove it. I sat at the bar for a drink and una botana or appetizer. It’s very common to be served an small bite of something when ordering a drink in Mexico. I was served refried beans and chips with my Paloma, a cocktail made with either grapefruit soda or mineral water and grapefruit juice and of course, Tequila. Zinco Jazz Club There are so many interesting buildings in Mexico City and I love to see ones that have been re-purposed. Zinco is a jazz club in an old bank. You enter into an unassuming outside door, go up some steps and then down into what was once the vault for a total speakeasy experience. Inside, it’s a small, intimate space with a stage offering live music, food and cocktails. I had a Mezcalini with you guessed it, mezcal, tamarind, orange juice and cointreau. Reservations are recommended especially on a Friday or Saturday night. There’s no cover charge unless there’s a special band playing. Check the website for the calendar. La Casa de los Azulejos or House of Tiles has exterior walls made of blue and white tiles from the Mexican state of Puebla. It was once a private house but has since been purchased by Sanborns, which is a chain of Mexican department stores that have restaurants in them. The restoration work they have done is incredible. Even if don’t eat, it’s worth a look inside. Courtyards, fountains and more tile than you can imagine are inside. However, you should eat in the restaurant. The enchilada suiza was stuff dreams are made of. Served with the freshest salsa on their signature blue and white china. There is a main dining room or if you don’t want the fanfare of sit down service, there is counter service too. 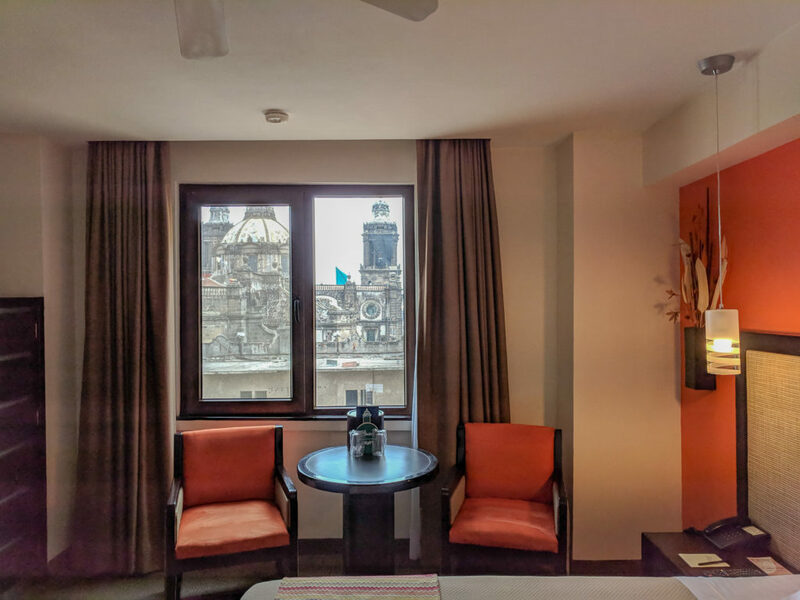 In keeping with my old school theme, I stayed at Hotel Catedral, a historic hotel just steps from the Zocalo or central square, which by the way is the largest in Mexico. You can easily walk to the Cathedral, the National Palace and the points of interest. The hotel offers a really good breakfast buffet, concierge services and accommodating English speaking staff. Some of the rooms even have small balconies. While I didn’t have a balcony, I had a great view. Money– You should change your dollars into pesos. If you pay with dollars, you will get change in pesos and the exchange rate won’t be good. Banks have the best rates. Change houses or caja de cambios would be the next best place. You can usually exchange money in your hotel but the rate isn’t as good. ATM’s are easy to find and offer a competitive exchange rate. Just remember you will have possibly two fees added in. You should always keep for some small bills and change for tips and other incidentals. I usually change a small amount at the airport when I land for incidentals before I can get to a bank or change house. Safety– The Historic District, and much of Mexico City is safe but as in any big city you should be cautious. Guard your wallet, purse or backpack. I always use a cross body bag with a sturdy strap. One of my favorites is a PacSafe bag that has an extra reinforced strap. Also don’t carry all your cash on you. If you are concerned about walking around, check with your hotel or one of the many foot policeman around. Also don’t flash around jewelry or your phone. Weather– Because of the high altitude, Mexico City, it can be a little cool, even in the spring and summer months. Carry a sweater or light jacket or rain jacket and even closed toe shoes. When I was there in May I was happy I had carried some short boots. It was rainy and the boots came in handy on the cobblestone streets of the historic area where the water pooled. Have you already been to Mexico City? Let me know what’s your favorite thing. If you liked this article please pin it here.